This part of the Causeway Coast Way is the longest section that is off-road and is relatively isolated as a result. Once having left Dunseverick Castle, the next sign of a public road is 9km later at the Giant's Causeway. The trail follows a grassy path that curves around each headland and gradually ascends all the way to Bengore Head. There are many fine viewing points over the cliff edge to the sea stacks below and across the sea to Rathlin Island. Past the large stack of Benadanir is Port Moon and down at the base of the cliffs a remote fisherman's cottage can be seen. This was used as a base in the past to net salmon but came to an end in 2002 with the gradual dwindling in salmon stock. Contham Head is at far end of Port Moon and as the trail passes here it continues to climb until Bengore Head. When it levels out here, it is the highest point on the Causeway Coast Way at just over 100m above sea-level. The next major landmark is Benbane Head and Hamilton's Seat. Dr William Hamilton's has long been associated with the Giant's Causeway through a series of published letters in 1786, identifying the geology of the area as being volcanic in origin. 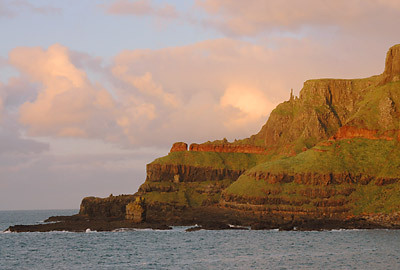 Once past Benbane Head, the Causeway Coast Way crosses the boundary into the UNESCO World Heritage Site that is associated to the Giant's Causeway. At the base of the cliffs, just off-shore, is the readily identifiable shape of Horse Shoe Harbour. The rock formation known as the 'Nurse and Child' can be seen at the top of the horse-shoe. It is one large, erect rock cradling a smaller one. A little further on from here is the site of the 'Giant's Eye Glass' which can be seen marked on some maps but is difficult to identify. This is because the sea arch that once resembled a glass monacle has now collapsed into the sea. Beyond Benanouran Head is Port na Spaniagh where the ship wreck of La Girona lies off Lacada Point. Golden treasures from this Spanish Armada vessel were retrieved in 1967 by Belgian divers and are now on display in Ulster Museum. The number of major landmarks begin to intensify when progressing into the Amphitheatre. The first of these are and the isolated columns at the start of the valley head and are known as the 'Chimney Tops'. They can be viewed from above on the trail. The Amphitheatre itself is the impressive mass of vertical basalt columns that are embedded into the cliff-face and span right around the bay of Port Reostan below. The next bay is Port Noffer and the main Causeway area can be seen below. A flight of steps leads down part the cliff and then zig-zags the remainder of the way. There is an option to turn right at the first T-junction and view the Amphitheater once again from a lower perspective. Otherwise the left turn at the T-Junction leads past the large rock known as the 'Giant's Chair' to reach the main Causeway area. The Grand Causeway is the epicentre of the iconic sprawl of hexagonal columns that form a plateau out into the sea. Although the site is infinitely busier with tourists than the rest of the trail, it is worth exploring the area to see at close quarters these rock shapes that have made the area so famous. Once finished at the Grand Causeway, a road curves around Port Granny and begins to steeply rise up past the Stookans and finally up to the end of this section at the Visitor's Centre.